Every video game veteran has a title in its back catalogue which for unknown reasons keeps being dredged up for modern audiences. With Nintendo, it's arguably Urban Champion — a game so lacklustre that it wasn't wanted even back in 1984 — while one-time rival Sega has Altered Beast. A shallow 2D brawler in its original arcade form, the 16-bit Mega Drive conversion was faithful in that it was just as repetitive and uninspiring. However, its status as a pack-in title — and, for the time, a visually impressive one — seems to have granted it a place in Sega's history that is totally out of proportion to its actual quality. Which is no doubt why we're still being asked to play Altered Beast on the 3DS, a full 25 years after the game first graced arcades. 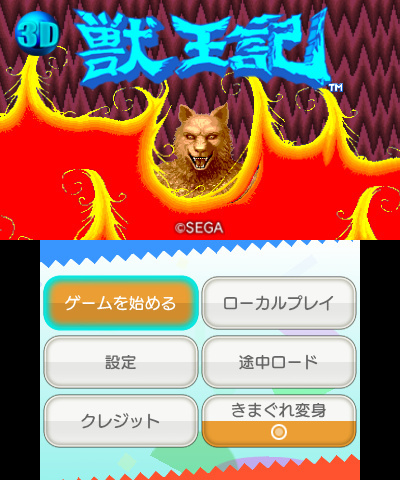 Updated as part of Sega's 3D Classics range, 3D Altered Beast benefits from expanded options and a subtle 3D effect, but nothing has been done to rectify the biggest single issue with this title: besides a few amusing voice samples, it's simply not that much fun to play. At least the setting is relatively unique, even for today. Placed in the sandals of a resurrected Roman centurion, you're asked to rescue Zeus' daughter Athena from the clutches of the Demon God Neff. To aid you in your quest, Zeus grants the power to transform into various beasts — hence the title of the game — which drastically improves your chance of success against the numerous monsters which stalk each of the game's five levels. In human form, you can absorb two magical orbs to boost your power, while the third triggers the beastly metamorphosis. As a human, you can punch, kick and jump, as well as perform upwards kicking attacks when crouching — very handy for dealing with airborne enemies. Each beast has special powers which are mapped to the punch and kick buttons. For example, level one's wolf can hurl fireballs and perform a charging attack, while level three's bear can turn enemies into stone with its breath. The variety on show is one of the title's few redeeming qualities, but even in this respect it falls a little short — level five's golden wolf is almost identical to the transformation from the first stage. Each stage is incredibly short, and the entire game can be completed in a single sitting — we managed to clock the end credits in under 20 minutes. Local co-operative play is available, but this only serves to make things even easier, and the cramped nature of the levels sometimes means it is hard to keep track of the action. Once you've rescued Athena there's very little reason to return to the game; developer M2 has included the option to randomise the beast transformations, but this isn't as enticing as it might sound — many of the levels are designed with a specific beast in mind, and by switching these around it actually makes it less appealing to play — which is a pretty amazing achievement, when you think about it. 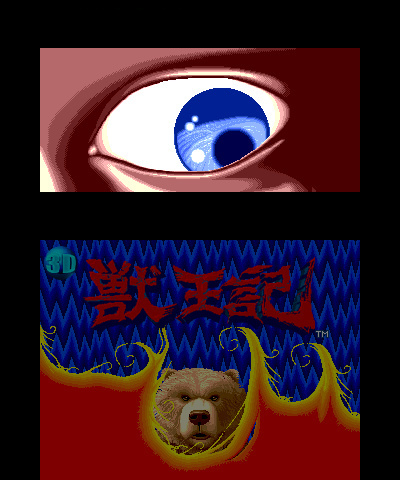 The 3D effect employed in Altered Beast is so subtle that you might even miss it, and aside from being able to re-map buttons, overlay a CRT-style screen effect and listen to the admittedly atmospheric soundtrack, there's little else to tinker with here. While M2's other 3D Classics titles have been made even more enjoyable thanks to a raft of settings and toggles to mess around with, Altered Beast is such a trudge that it would have taken something pretty special for the same magic to work. M2 has done a typically peerless job of porting Altered Beast from the Mega Drive, and proves once again that it is the master of retro emulation. However, one has to question the wisdom of wasting so much time and effort on converting such a dismal game; Altered Beast fails to entertain during its criminally short length and really should have been relegated to the mists of time by now. It would have made more sense to port the arcade original, which at least boasts a humorous ending similar to the one seen in the coin-op version of Golden Axe. Long-time fans of the game — and yes, they do indeed exist — will no doubt wish to own this purely for nostalgia's sake, but everyone else should retain their pennies and spend them on one of Sega's other, more worthy 3D Classics. I bought this out of nostalgia. And after playing through it remembered why I got rid of my Genesis copy in college. Did like the 3D effect tho, and the sound is nicely old-school. I want this game purely for nostalgia. One of my brothers had the Tiger handheld version of this one. Primitive but enjoyable. Never played the Genesis version. The effort spent here is indeed questionable. That said I am enjoying what M2 are doing here immensely with the titles I feel are still fun. @manu0 What interview are you talking about? I like this game. It's an OK port for the 3DS, but M2 didn't put so much effort on this one, far from being a great version. They could've done much more, looks like they were in a rush or just wanted to make really basic stuff. Really disappointed that it's not widescreen which, for me, is a must. The same for Sonic and the rest of the upcoming Sega 3D Classics. But hey, I really appreciate that Sega is bringing some new games for the 3D Classics series. Getting all eight games myself by the way. Space Harrier and Super Hang On received more attention. You managed to clock the end credits in 20 minutes because you kept Continuing, you mean. I own an original copy for my Sega Genesis (model 3). I haven't played it in forever simply because the video cable(s) I have don't work. Such a shame. I actually think this title isn't half-bad. Not the best by any means, but not as bad as the article makes it out to be. I've never actually passed the whole game (I'd get my donkey handed to me) on the Genesis version though. It was one of the most enjoyable games back in the Genesis Day, MUCH BETTER THAN the Donkey Kong games. The reason to give much higher score on the boring Donkey Kong original games than this game is pretty obvious. This is the first game I ever completed many years ago! Didn't I read on here that there was a huge debate among the nintendolife staff concerning this game or remake? Or did I imagine that? Might be interesting to get a transcript or maybe have an article of who took what side. That they chose this to port over Alex Kidd in Miracle World, Comix Zone, or Ristar is just sad. One of my chiodhood favorites. Reviews on Sega's 3D titles should be based on the success of the conversion. This game was a system seller. Most of Sega's ports were as good as, if not better, than the arcade originals. I was floored when I saw this demo-ing in Children's Palace for the first time. If you don't like the game, so be it. It's still a legendary piece of the history of the Genesis/Megadrive. And should have a spot in the heart of many a Genny fan. The reason they did the Genesis/MD version instead of the arcade version is because M2 created a virtual Genesis/MD dev kit tempalate that makes Genesis/MD games much easier to port over. This was one of few games that actually put the Sega Genesis under my radar as a child! I disagree with this review, Altered Beast is a fun game especially playing it with a friend. I wouldn't compare Altered Beast with Nintendo's crappy Urban Champion thats simply uncalled for. @PenCapChew They try to add widescreen but they couldn't get a smooth framerate with it on, super hang on and space harrier were already programmed in 3d in the arcades, on the genesis classics they have to build 3d-programming into their emulator. Now sonic and altered beast were their first test, they said every time they port a genesis game they upgrade the emulator. I do believe streets of rage is widescreen now and future titles will be. It's not especially notable, but it is still a fun little side-scroller. Turning into different animals and experimenting with the variety of attacks is fun for at least half an hour at a time. Deserves better than a 3, at least. And it is vastly better than that pile of dreck called Urban Champion. M2 are not the best D4 enterprise are at least D4 gets the sound right. (M2 universally gets it wrong). To test I am using Youtube videos from real arcade hardware. The D4 Neo Geo stuff sounds indistinguishable to me. M2''s is always off. (Same with Sonic 3D Classic). Christian Whitehead's version is better. (Android version supports Xperia Play or any Android supported controller anyway). I guess It never really fit better on a Handheld. oh well, I well still enjoy this version! I enjoyed this game but and it is one that you should at least play once in your life, but it isn't worth getting just so you can play it on the go so if t you have it on the Genesis/Megadrive, don't bother. I wish they would make another, the idea was pretty cool. Why did they port the Genesis ver. instead the VCA version ? Altered Beast is the Genesis's version of Ryse: Son of Rome. Lots of attention given to making it pretty, none to making it play well. do you do anything but rage? Altered Beast is not a bad game really. It's an 80's arcade game all the way, and unlike the later ports the Genesis got like Golden Axe, no extra content was added to the core game. I'm not saying I would buy the 3D classics version, but I have several collections and a Genesis handheld that include the game, and I still play it. It's shallow mindless gameplay, perfect for wasting a few minitues. Not the best Genesis game, but its still one of my favorties. I am curious as to why they picked the Genesis version over the arcade one. The Arcade version has some graphical effects that would have looked great in 3D. @PenCapChew Thanks for posting that link. It was an interesting interview! Also, from reading your username, I'd say you are a Nirvana fan? Easy? Beat the game in 20 minutes? I can't even get passed the second stage, no matter how much I try. I like this game, it's a guilty pleasure for me...I just wish they would have added some continues in the game. While Urban Champion is definitely bad, Altered Beast I don't agree. For it's time it's great but even today there are still a few people like me who would gladly replay this classic again, maybe not in-deph throughout but perhaps for a short ride on the bus or a vacation trip somewhere, it's well worth the enjoyment. I love this game and M2 did a fantastic job porting it and putting it into 3D. So you're a Roman centurion doing a quest for a Greek god against an enemy who doesn't exist in either mythology with a style of divine help never previously associated with Zeus? Okaaayyy. Well, at least they got the fact right that Athena is indeed Zeus's daughter. I have the Arcade version on my Wii and I don't like it that much. Magician Lord on the other hand I still think is great. (Even the hassle of forcing it to 60hz each time as it is on my PAL wii is worth it). 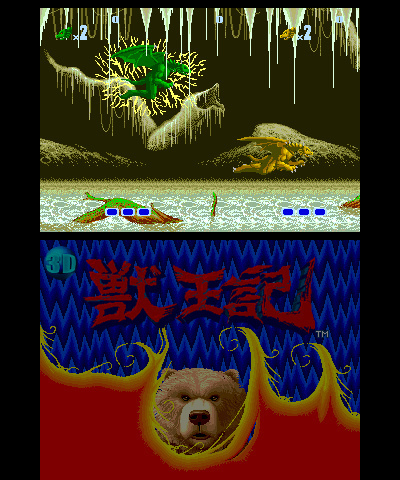 I didn't find Altered Beast - VC Arcade difficult. (Magician Lord on the other hand on MVS difficulty I can only get to the 3rd level). Altered Beast is one of the greatest games of all time. This is why one should never trust reviews. POWER UP. @TheGZeus I'm sorry. I don't see the rage in my post. I certainly didn't feel any rage while posting. I guess the type written word can't account for inflection and whatnot. That's probably why we have smiley emotes. @SirGreatNose Your snide, opinionated post caused me to infer anger. Few people can be such a putz without being angry. "THE ONLY WAY TO REVIEW A RETRO GAME IS TO SAY WHETHER OR NOT IT IS PRESENTED ACCURATELY!!! NO GAME SHOULD EVER BE REVIEWED ON ITS OWN MERITS!" Considering you want this Nintendo NEWS/REVIEW site to be Nintendo FAN site I'm surprised you didn't get angry that a Mega Drive/Genesis game was being reviewed. Cool! I got a follower! This game is fun. Still play it on the Genesis and Virtual console all the time. @gojiguy This and Sonic are as far as I know the ones with the least amount of effort put in. (If they have improved the emulator after later releases they should provide an update). Only really good for A) Nostalgia, or B) A history lesson-look how much Sega/the Megadrive improved from this in 1988 to Streets of Rage 2 in 1992. I admit Altered Beast isn't the ... fullest ... of games but boy does it make me feel good & I think that is where it's strength & longevity lies. Memories of having flogged everything ST & getting my Mum to rush me down to Kilby Bridge Motors to pick up either a PC Engine or a Mega drive, the imports had landed! Yes my import game shop was in the back, well front of a garage, those were the days, full of wonder. Altered Beast was the weapon of choice for both systems & they both looked amazing compared to my recent ST gaming. The Mega Drive won, pretty much hands down, although it did take at least an hour to decide, I put it down to being simply mesmerised by both systems as to this day I still crave a PC Engine. Still have the Japanese Mega Drive & the copy of Altered Beast & they both work just fine. This is simply one of those games that fills me & I guess many others with so much warm gooey gaming history goodness that we will forever be at its command to "rise from the grave". My 3DS had laid dormant for 6+ months before the Sega 3DS games started hitting the eShop & so far I love them all & for the first time in I don't know how long I now anxiously await the Thursday eShop update. Please Sega don't make us wait so long for the next round of awesomeness. Just checked my old game shop out & they are still about & still linked with Kilby Bridge, I remember they moved into the nearby town for a while & then got involved in Jaguar (thank goodness as I loved my Jaguar) & GBA games, thought they had gone, excellent, glad they still exist. @mOOgBunny I assume you're talking about Telegames? Sadly the company is all but dead in the UK, I spoke to the owner a few months back and he's looking to sell off what little stock he has left. Sad times, as I also got my Japanese Mega Drive from there way back in 1989! I also picked up a Neo Geo AES from the store during my student years. @Damo Yeah out in the sticks but near Leicester. That is a real shame about Telegames, thought the site looked a little static. I just remember the shop being like a little treasure trove full of exotic looking goodies, sometimes you wouldn't even know what you were buying been addicted to Japanese packaging ever since. Didn't like the town shop so much, it was less Gremlins & more Gremlins 2 if you get my drift. The money I must of spent with them over the years, it hurts to think about it, £110 for SNES Streetfighter, £90 Super Star Wars, what was I thinking??? just to get them early??? Those days are long gone (thought it was meant to be the other way round), now it's £4.49 Sega 3D all the way. I'd still say this game is 10x more enjoyable than Rayman Origins. My thoughts on Altered Beast: it has definitely aged a lot, substantially so I might add. It's got some good visuals and sounds for its time, and the faltered sound bytes for "Rise from your grave!" and "Welcome to your doom!" are bad, but they're in the "so bad they're good" quality. However, it doesn't help that the game can feel repetitive and stiff most times, which is a big turn off for most of the people that played it. What also doesn't help this title is that it lacks proper polish, not to mention that many games have come and gone since then (which are for the majority better), which as a result makes it very easy to look at Altered Beast in a negative way. Yeah, I'd be lying if I didn't say I feel this way sometimes, I definitely do; but to give it credit it has left behind a legacy, being one of the first games to be available for Sega's 16-bit power machine (alongside Super Thunder Blade and Space Harrier II, but those two are irrelevant to what I'm talking about). As one of Sega's first MegaDrive/Genesis games, it's serviceable, nice to play for a few short bursts, and it did pave the way for their 16-bit era (so I respect it in that regard). Buuuuuuuuuuut, looking at this game in 2013 (in twenty-two days 2014), yeah, Altered Beast is at a very huge disadvantage (Sega's completely outdid this game by creating better ones). While I can't say it's terrible (and again, I get where people are coming from), it is a bad game nonetheless (and a tedious one too). But look on the bright side: there is much worse out there than this game. @Windy: This game is awesome, short or not. Clearly, the reviewer was never a fan of this game. I give this a 7 at least. The random transformation option is interesting to say the least. Bought main due to me owning a copy of the GBA Altered Beast game and wanting to show Sega/M2 some support. This game is and always will be a true classic. I loved it when it first came out at the arcades, especially for its mythical roman setting. The beast transformations were awesome and hadn't been done before in a beat- em up, and it was a blast to play two players. So what if it was short, it as an arcade game after all. The Megadrive conversion was great for its time, very close to the coin - op. The only real downside to the game is that SEGA never turned it into successful series. A real shame as the world of Altered Beast has so much potential. 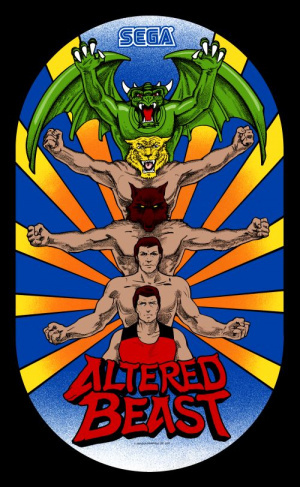 They did the arcade version of Space Harrier so why did they not do the arcade version of Altered Beast? @KnightRider666 I actually have a soft spot for this game, largely because I got it back in the early days of Mega Drive importing and played it to death. However, nostalgic connections aside, this isn't a great game by any means. Both the arcade original and the domestic port were clearly designed to dazzle visually but the gameplay is shallow, repetitive and dull. Alerted Beast is a game that has a small place in my heart as a Sega fan, but I'm not so blind that I can't see how terrible it is. @mOOgBunny Awesome! I used to live in Hinckley and thee visits to Wigston still loom large in my memory. I remember paying £40 for a Mega CD converter, and my mate picked up J-League Perfect Striker on the N64 for £100 - money well spent considering how much entertainment we got out of it. I'll never forget those early trips though, like you say, it was a cave of gaming treasures and no mistake. I only visited the Leicester store once and was very unimpressed. @Damo lol... if altered beast is shadow, so does mario 1. Ahh, Golden Axe is hopefully in the future coming as a 3D classic. I loved playing that on my Amiga. It was a really faithful port of the arcade version. Even had the same ending as the arcade version linked in this review. According to the "bought this because of nostalgia" feeling, I should kill myself riding a tricicle instead of a bike and drink grape juice instead of wine. No way! I loved this at the arcade when I was a kid. I also had the pack-in when I bought the Sega Genesis on launch day (the only system I ever got on launch). I think I'll have to get this as well. I recently played Altered Beast a couple of times. It was fun for a short while and then quickly felt tedious. I can definitely understand how it might have amazed people when it came out and it was a good arcade game for the time, but time has not been as kind to it as it has to other games of the time like Golden Axe, which I've compulsively played several dozen times this year. I can't hold the game's length against it due to its arcade origins and adding extra content wasn't yet a common practice. Golden Axe isn't much longer but is a more interesting experience as the enemies are not as easy to predict. @gojiguy: I'm glad I'm not the only one. @Damo: I do agree it's short and repetitive, but I still think it's awesome regardless. Most arcade classics are the above, but that doesn't mean they are terrible. Then again, I love arcade classics in general; so I may find it easier than others to look past it's shortcomings. To each their own. The original Donkey Kong got a 6/10 and your're calling this shallow? I have to agree with the review. If I didn't play this as a kid, I'd probably pass on it now, and I wouldn't blame others for doing the same thing. I always hated Altered Beast, and its always painful to argue that with my friends. Finally NintendoLife made justice for giving this weak, boring, irritatingly bad game what it deserves. No I'm not buying it for nostalgia. When I was a kid, I loved playing games, but never had anyone outside of a Pac-man loving grandmother to play with. That all changed when I met one of my closer friends in the 3rd grade. I went over to hang out at his house, where he had a Sega Genesis. I had one myself, but the game he showed me was one I hadn't heard of, but I fell in love with it right away - that game was Altered Beast. While the game certainly has aged rather disgracefully, as mentioned by a few others here, its legacy is what matters. It has a very strong nostalgic value being that it was one of the first games that really popularized the side-scrolling beat-em-up. It did a lot of things wrong, absolutely - no extra lives [I've never gotten past level 4, and I'm pretty sure that if they were available, I'd have gotten one by then], no continues, and a few very overpowered enemies [i.e. the bird thing with the long tail that you can ride in games like Golden Axe, that thing will kill you ridiculously fast in AB]. However, it's still damn fun to play, despite its flaws, and it's one that I'll always have in my library in some way, shape or form. I hope to get my old Genesis out one of these days, and to buy a physical copy of this.